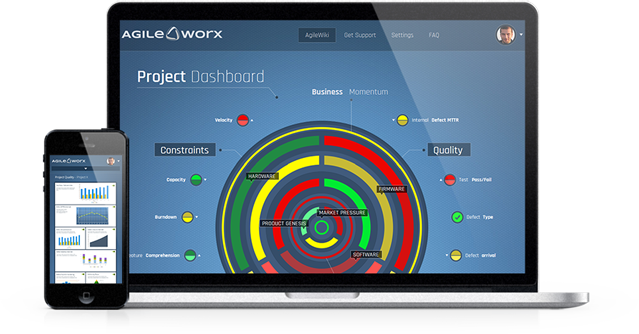 Agile Worx: – Agile Management Platform. Agile WorxTM productizes the systems and methods used by our most successful case studies. The Agile WorxTM platform combines sophisticated planning, analysis, forecasting, and visualization tools with robust multi-level management based on Agile Vortex theory and the MetagilityTM approach. Agile WorxTM delivers the most comprehensive software solution available for scaling agile to support complex and highly innovative product development. Agile Worx™ is built on agility concepts so that you can transform your business as well as your development teams. Based on over five years of intensive research, Agile Worx ™ recognizes that executive leadership, understanding, and support is key to the success of any agile transformation effort. The Agile Worx ™ platform provides the solution to make that happen. Easy, and straightforward navigation eliminates the time consuming searching and guesswork associated with obtaining important project management and team performance data for your organization. Agile Worx™ includes an innovative user interface that provides clients with instant status of their agile projects, programs, and teams. Agile Worx™ is a SaaS (software as a service) solution that lowers cost, reduces downtime, and eliminates troublesome installation issues. Agile Worx™ supports PC and mobile platforms, so you can obtain instant status and reporting anywhere you are, anytime. Agile WorxTM transforms the way organizations enable and manage agile productivity across their enterprise, programs, projects, and teams by aligning business strategy with technical execution. The Agile WorxTM platform combines sophisticated planning, analysis, forecasting, and visualization tools with robust multi-level management based on Agile Vortex theory. The Agile Worx platform complements and extends existing agile tools, methods, and processes and can be deployed via the cloud or on premises. Agile WorxTM also provides customized cloud-based big data KPI and analytics development and consulting services worldwide. Aligns strategy with execution with instantaneous status and comprehensive agile-based reporting with over 100 available metrics. Gives management the ability to see what’s going on with their development teams, and optimize team performance and resource utilization. Case study: The company utilizing Agile vortex theory became the undisputed leader in their market within 30 months. Case study: Development capacity increased by 23%. Timely implementation of a new product or service that demands more effective collabora-tion /alignment. Case study: Continuous growth in market share and profit resulting in a CAGR of 23%. Case study: Reduced cost of development and maintenace by over 15%. Case studies were able to eliminate legacy commercial tools which saved several $100,000 per year. Sign up for our free trial and see if our product is right for your business. No credit card, no hassle!